The full truth is important not only for Giulio’s case, but also for the hundreds of Egyptian citizens who have disappeared, many of them almost certainly suffering the same grisly fate that he did. Giulio Regeni. Amnesty International.Probably seven or eight Italians out of every ten now know that there are human rights violations in Egypt. That Egypt isn’t only a place you visit to see the Pyramids or to go scuba-diving in the Red Sea. Why is that? It’s because people across Italy have been alerted to the terrible case of the 28-year-old Italian PhD student at Cambridge who was abducted, horribly tortured and killed in Cairo just over a year ago. 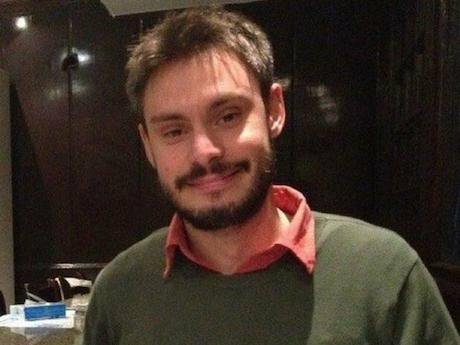 His name, of course, was Giulio Regeni and we at Amnesty Italy have been running a Truth for Giulio (“Verita per Giulio”) campaign ever since. The basic symbol for the Verita per Giulio campaign is very simple. We’ve asked people across Italy to hang out a yellow campaign banner with the words “Verita per Giulio” wherever possible. From their windows, their balconies, the facades of public buildings. This simple gesture has taken off throughout the country. Photographs of Giulio’s family with the banner on their small house in the north-east of Italy have been published widely. The image has become almost ubiquitous in Italy. The main object of our lobbying has been the adequacy (or otherwise) of the Italian government’s reaction to Giulio’s murder. By mobilising public opinion we believe we’ve successfully pressed the government into taking action. At the beginning, the Italian government’s reaction was surprisingly encouraging. Paolo Gentiloni, then Minister of Foreign Affairs (now Prime Minister) made solemn statements in parliament and to the media saying the Government would accept nothing but the full truth. “We don’t want a convenient truth”, he said. “Diplomacy should not prevent us from being straightforward in asking for the truth”. The authorities in Rome also said they’d be adopting proportionate measures. Proportionate was a useful word from Amnesty’s point of view because it allowed us to argue as time went by and little progress was being made that the proportionality requirement needed something else to be done. What the Italian government did rather promptly was to withdraw the Italian ambassador to Egypt. This wasn’t typical. Italian diplomacy is traditionally cautious. In response Amnesty argued that commercial relations between Italy and Egypt should be looked into. Not the whole spectrum of commercial relations, but specifically arms and security transfers. We got one small result. The Italian parliament voted to suspend the provision of spare parts for planes Egypt had bought from Italy. It was an important political statement, although more symbolic than practical. We have to push forward in order to prevent the Italian government taking steps backward. We have also argued that the Italian government could invoke its rights under Article 30 of the UN Convention Against Torture to set up a tribunal to arbitrate in a dispute with Egypt over the interpretation and application of the convention. If that were not successful, the Italian Government could even unilaterally go to the International Court of Justice. However, I don’t think the government is ready to accept that there is actual dispute with Egypt, let alone, take things one or two steps further. But Amnesty’s real objective has been to show that there were other measures that could be adopted if Egypt did not cooperate. The real question is one of political will. We have to push forward in order to prevent the Italian government taking steps backward. There has been talk during the last months of sending the Italian ambassador back to Egypt. We hear media reports that the government doesn’t confirm, but has never denied. Apparently the plan is to send the ambassador back “provisionally”. “Provisionally” doesn’t mean anything in diplomatic terms - all diplomatic relations are provisional, as far as I know. The Prime Minister has answered questions in press conferences saying that cooperation with Egypt is good, which is not really true, and not a good sign. Unusually, prosecutors in Rome issued a statement after that - when questioned by the media - saying that they had no expectation of improvement in terms of judicial cooperation. There was a different reading of the situation from the executive and the judiciary, which was interesting. The Italian authorities are very likely waiting for public attention over Giulio’s case to drop away in order to be allowed more flexibility. We know there are big items on the Italian government’s agenda regarding Cairo. These include getting the assistance of Egypt to prevent migrants reaching Italy through Libya, security, anti-terrorism and energy. ENI, a major energy firm in Italy, has substantial operations off the coast of Egypt. So there are business interests at stake as well. The Italian authorities are very likely waiting for public attention over Giulio’s case to drop away in order to be allowed more flexibility. We see it precisely as our role to prevent that from happening. That is part of Amnesty’s current campaign. We collected 60,000 signatures calling on the Italian government not to send the ambassador back, handing them to the Prime Minister’s office on 25 January. Meanwhile, we organised 25 events in towns and cities across Italy with hundreds of participants under the Verita per Giulio banner that day. This campaigning plays a key role in relation to the criminal investigations. There are two parallel criminal investigations. One is in Egypt, which is based on the territorial link, which is the standard jurisdictional criterion in criminal cases. The other is based on what we refer to as passive nationality, that is - the nationality of the victim. Giulio was Italian. The Italian criminal investigation into his murder is provided for by Italian law. There are some additional procedural hurdles, but there is no question that the investigation into Giulio’s death will be brought forward by Italian prosecutors. It is very important that there should be an investigation in Italy because human rights violations should be investigated by the broadest range of countries possible. In practice, without cooperation from Egypt, the Italian criminal investigation will go nowhere. It is very unlikely that they will ever be able to prosecute anyone if the Egyptians don’t allow that to happen by providing the necessary information. So pressure from the Italian government on the Egyptian authorities (including the Egyptian judiciary which is clearly not independent) is essential in order for the Italian investigation to proceed. The Egyptian authorities’ reaction to the Giulio Regeni case has been predictable. In my experience, numerous countries follow a set procedure when their security forces are accused of torturing someone, whether it is their own citizen or a foreign national. The first step is simply to deny the facts, to tell lies and set false trails. Giulio’s parents have been told that he was the victim of a robbery and that the five people responsible were killed in a shoot-out (surprisingly a couple of them with one bullet in the head, which is highly unlikely in a shoot-out). They talked about Giulio dying in a car accident. There was an autopsy which clearly contradicted that theory. All sorts of stories. The Egyptian authorities’ reaction to the Giulio Regeni case has been predictable. Once these turn out not to be credible, then step two is usually to provide limited, partial, fragments of the truth. Low-level people are blamed for what happened, but the higher echelons are left untouched. We have the impression that this is more or less where we are at present. There may be prosecutions. This is better than lies. It is one step forward. But it is not what we want. We want the full truth. Truth and justice, which means reparation, which means punishing all those who are responsible.